Your hotel / residence, the Villa du Lac in Divonne-les-Bains, invites you to prepare gently the end of winter. Everything is suitable for relaxation and fitness thanks to aquagym, aquabike classes and our fitness area (treadmill, elliptical trainer, stationary bike, rowing machine). 1 balneo treatment (1 bath) per person per night: This invigorating and relaxing bath, lasting 20 minutes, offers you an evolutionary drainage made by numerous jets programmed on different regions of the body. 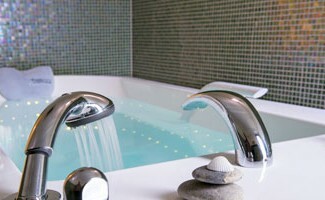 This care promotes blood circulation and relaxes the muscles for a moment of unparalleled relaxation.